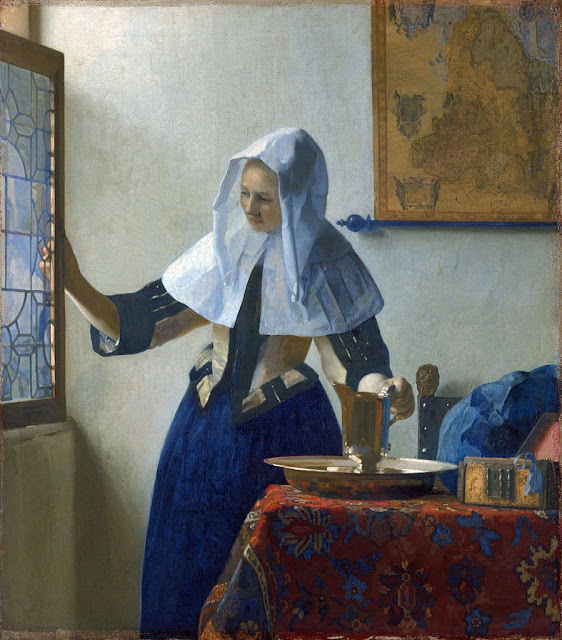 Random Noodling: Ekphrastic April 2019, Day 4: "Young Woman with a Water Pitcher"
Ekphrastic April 2019, Day 4: "Young Woman with a Water Pitcher"
"Young Woman with a Water Pitcher" (circa 1662) by Johannes Vermeer [1632–1675]. I love this a lot, Diane. I am writing 2 ekphrastic poems connected to an art show at a local museum. I like your brevity and strength here. A poem last year was from a painting of 2 old-fashioned looking brown and tan clay pitchers on a cart. Brought me to my grandparents' kitchen. Janet, I'm interested in your experience with the local museum. Were you contacted or did you contact the museum about writing the poems? I am in a Pen Women group and we have a relationship with a small, but thriving art museum in a small city near where I live (near Syracuse). So we have gotten to know them. It is for First Friday and the show is a wonderful one called Made in New York. That show has been around for a while and is juried. There are probably 100 works to choose from. Last year we had a large audience for a poetry reading. That was great. So....I would see if I could reach out and make some connections at a place that might invite you and perhaps a few other local poets (or those you invite who could/would attend) to give it a try. Many of the artists came to the reading last year and were quite moved. The woman whose painting of a dancer I did wanted to purchase my other poem to give to her friend ! That was a lovely idea but I gave it to her gratis. Of course I am working on revising that poem. It never ends, I fear. I have to start on this year's poems asap. Mine are longer than your lovely cheritas. I might give that a go but perhaps combine two cheritas and see how it flows. I am not really great at forms and need to study so I can give them a better go, so I stick to my free verse and hope that those reading it, can read it in a way that is meaningful as I hear it. I love that you are doing this wonderful NaPoMo writing. Terrific inspiration and work. Janet F.
I love the variety of blues in the painting! There is more than the sunlight. I love your poem, Diane. That's the conundrum of life, isn't it? Are we allowed to enjoy the beauty, even as we see all that needs so much work? It's all about the light, isn't it?